3D printers can print in just about every material imaginable these days — but when it comes to colors, your choices are still somewhat limited. Sure, there’s a practically endless number of individual filament colors to choose from, but unfortunately, most printers can only handle one or two filament types at a time. If you want to make something multicolored, you’re pretty much out of luck — until now, that is. Thanks to a company by the name of ORD Solutions, there’s finally a FDM printer that can print an entire rainbow in one go. The RoVa4D, as it’s called, works by extruding separate cyan, magenta, yellow, black, and white filaments into a single hot end, where they’re blended together and deposited from a single nozzle. This works just like the inkjet printer you have at home, except that in this case you also need white filament, since we aren’t printing on paper. 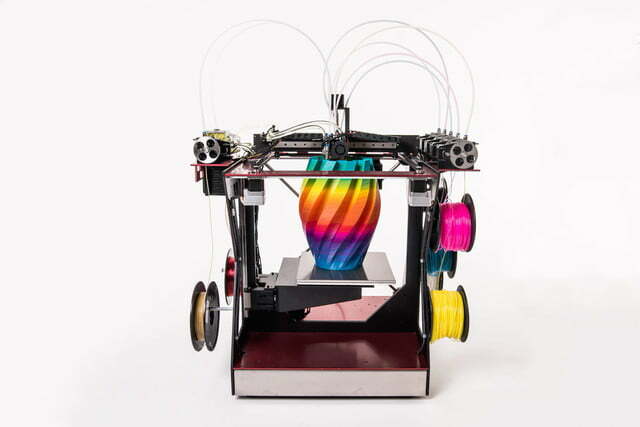 The combination lets you print unlimited colors in a single print. A few months from now, somewhere in Cambridge, U.K., a little known company by the name of PiBorg will host the world’s first international autonomous car racing grand prix — and you and your friends can enter. 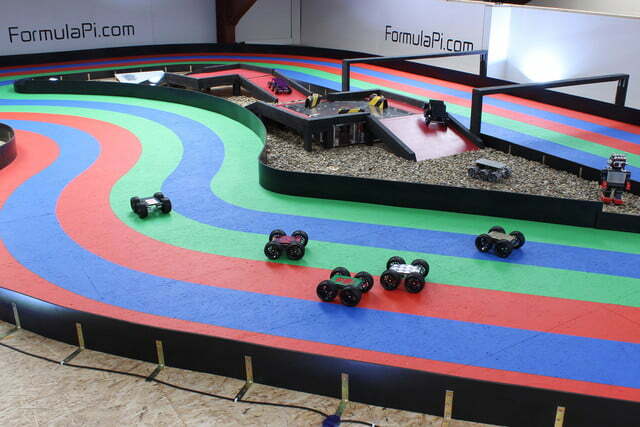 See, the cars in this competition are actually toy robots designed to zip around a colorful 20-meter track. Dubbed “Formula Pi,” the cars are powered with the help of a Raspberry Pi and a bit of clever coding from programmers around the world. In essence, the cars are like a DIY version of Anki’s AI-powered “Drive” slot car toys — but instead of coming with pre-installed, finely-tuned autonomous driving software, PiBorg leaves it up to you to do the coding. Your job, should you enter the competition, is to write the code that will help your car race around the track as quickly as possible, without colliding with other cars. When you’re ready, PiBorg will stage a series of races that will be broadcast over the internet for all to see. Pretty sweet idea, no? If you’ve ever tried memorizing lines for a video, you know firsthand just how much time it takes to film multiple takes, and then going back to edit out all the little screw-ups. To avoid this problem, professionals often use teleprompters, which allow the subject to look directly at the camera and simply read the prompts instead of memorizing everything beforehand. The only problem is that currently-available teleprompters are often too expensive and bulky, so filmmakers with limited budgets often turn to other methods — which result in a lack of genuine eye contact and warmth. That’s where the Parrot 2 comes in. 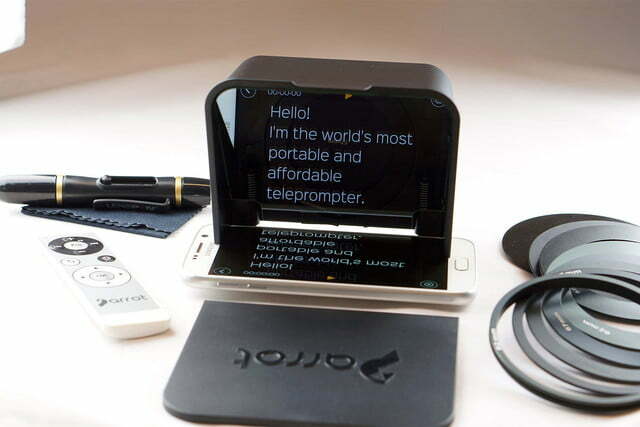 This brilliant little gizmo fits onto the front of your DSLR, and with the help of an accompanying smartphone app, reflects your script off of a mirror so your subject can easily read it. The Parrot is also ridiculously compact and simple to set up — something that both professional and indie filmmakers can appreciate. 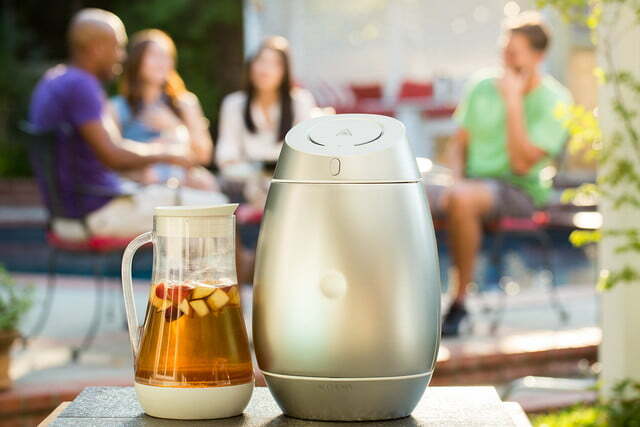 Developed by San Francisco-based entrepreneur Oscar Chang, the Alchema brewing machine is designed to transform ordinary pieces of fruit into a boozy pitcher of craft cider. To do this, users first browse and select their desired recipe via the machine’s companion smartphone application. After doing this, they simply load the required fruit, sugar, and water into Alchema’s companion pitcher before adding a specific amount of yeast. Once this is complete, owners then close the device’s door and wait roughly one to two weeks for the batch to ferment. When it’s all said and done, you’ll have a fresh batch of homemade hard cider. Unlike other at-home cider kits, Alchema requires very little cleaning and alerts users exactly when the fermentation process is complete — one to two weeks for cider, one week for mead, and roughly 16 weeks for wine. Additionally, the system constantly monitors air pressure, automatically releasing air if it starts building too quickly through the course of fermentation. Users even have the option of checking each batch’s alcohol contents directly from their smartphone and making use of the machine’s built-in weight sensor, which ensures the correct amount of ingredients are used every time. 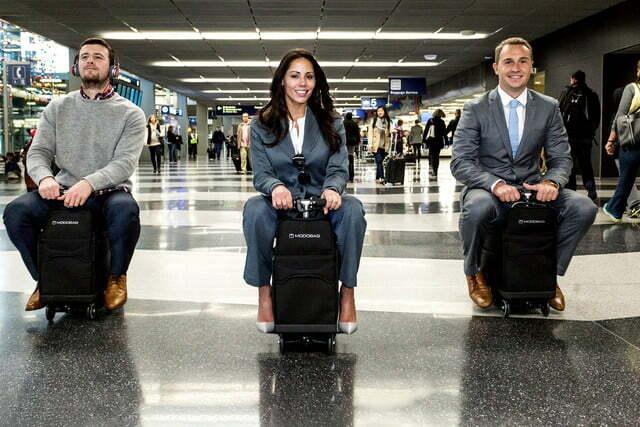 What if instead of dragging your suitcase through the airport, you could hop on top of it and ride it to your gate like a minibike? Sounds kinda ridiculous, but that’s precisely the idea behind ModoBag: the world’s first ridable suitcase With its 200-watt electric motor at full throttle, this “little bag that can” is capable of whizzing six miles through the airport terminal at speeds up to 8 mph on a single charge. At that rate, you’ll be able to get to your destination three times faster than the chumps who have to walk their way to their boarding area. It also features a dual braking system for those “uh-oh” moments when you’re about to crash into a travel companion or a fellow Modobag operator. More than just a pretty bag with wheels, Modobag also has a high-performance, sealed-bearing steering column, touch control dashboard, and dual USB charging ports for power on the go. It even has an optional GPRS/GSM tracking system that’ll help you locate your bag with a companion iOS or Android app. It offers 2,000 cubic inches of packing space, has a base weight of 19 pounds, and can seat riders up to 260 pounds. Best of all, it’ll fit in an airplane’s overhead bin and is completely compliant with TSA, FAA, and IATA regulations.